Everyone today has an opinion about online ads. At HubSpot, we wear two hats: we’re online marketers and online browsers who consume voracious amounts of content. So the ad blocking phenomenon, and the debate surrounding it, is incredibly interesting for us as observers. As inbound marketers, we see the need for businesses and content creators to hit their bottom line, but as online content consumers, we also see a lot of annoying ads. Based on the way the landscape is evolving, the future of online advertising is looking more and more tenuous. We wondered: is there a way that content producers and ad publishers can make money without creating a hugely disruptive and annoying ad experience? What kind of advertising do online browsers tolerate today, and why do they use ad blockers to begin with? 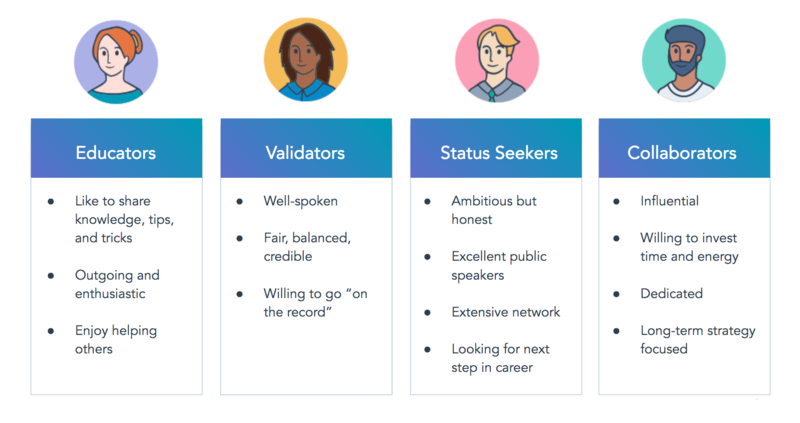 A previous HubSpot study revealed people really vent their ire on specific types of ads (think pop-ups and autoplaying videos), so we set out to find out more. To figure out what to ask, we partnered with AdBlock Plus, one of the most widely used ad blocking extensions in the world, to create the study questions and secure survey responses through SSI, an independent survey panel provider. Though AdBlock Plus was involved in the research survey, the views in this report are entirely HubSpot’s. Will People Turn Off Their Ad Blocker Or Pay For Content? Is It All Doom And Gloom -- Will People Accept Any Advertising Online? Let’s set the stage. 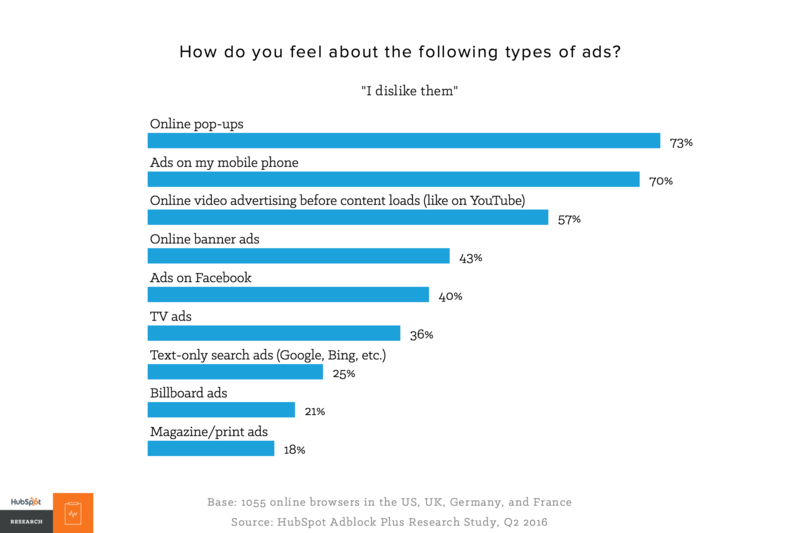 What types of online ads do people like and dislike today? What are their general views on online advertising in general? In our survey of 1,055 online browsers in the US and Europe, we found that they disliked pop-up ads, mobile ads, and video ads the most. Mostly offline ads like magazine and print ads and TV ads are viewed favorably. We also asked respondents about specific ad types and scenarios. The most frustrating experience for online browsers involve full page pop-up adverts that require the user to find an “X” to remove. More generally, 91% of respondents agree ads are more intrusive today compared to two to three years ago, and 87% agree there are more ads in general. 79% also feel that they’re being tracked as a result of retargeted ads. The most notable data points: the majority of respondents say that it’s the worst offender ads that give online ads a bad name. 83% of respondents agree that not all ads are bad, but they want to filter out the really obnoxious ones. 77% agree that they would prefer to ad filter rather than completely ad block. Perhaps this means there is hope for the ad industry -- if ad blocker users could simply filter out specific ad types, like pop ups or video ads, could that be enough to keep the lights on? A majority of our respondents also agree that most online ads today don’t look professional and are insulting to their intelligence (63% and 56%, respectively). Ouch. This is practical and addressable feedback: ads should look like some thought was put behind them. 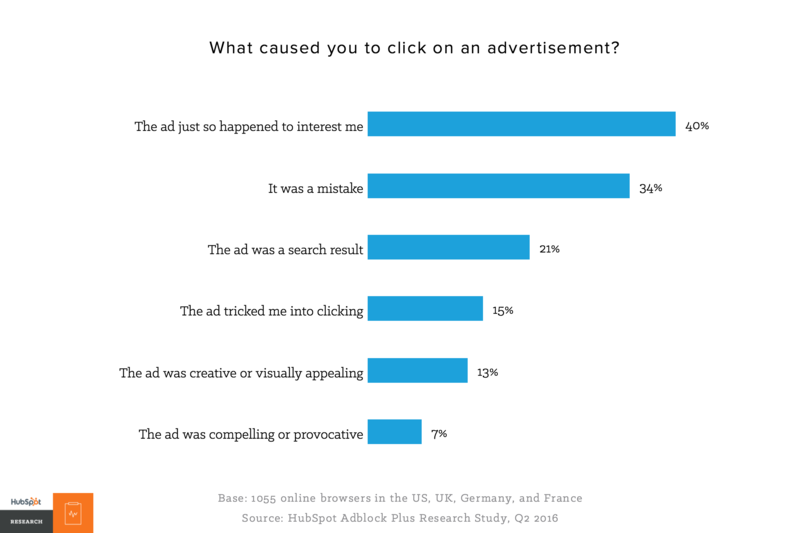 What’s worse, of people who have clicked on an ad, 34% said it was a mistake and 15% accused advertisers of tricking of them into clicking. Only a paltry 7% said it was because the ad was compelling. Advertisements have a lot of room for improvement. The ads being displayed now are not compelling. They are seen as deceptive, intrusive, and disruptive. If advertisers want to combat people’s negative impressions of ads, they need to double down on quality. The IAB’s L.E.A.N ads initiative is a respectable start. The first known ad blocking extension was developed in 2002 by Danish university student Henrik Aasted Sørensen, who said he was mostly procrastinating when he created the tool. Cut to 2016 and hundreds of millions of people (no one knows exactly how many) use various ad blocking tools to avoid the worst offenders in online advertising. We’ll unpack these top 4 concerns cited by our respondents with some examples from the general public. Few people would admit that they enjoy seeing a pop-up ad. Exactly describing an annoying or intrusive advertisement is tough, but most would point to a pop-up ad as the prime example of an annoying ad that interrupts a browser’s experience. After all, pop-up ads stand in the way of the online browser and the content they want to see. Online browsers have sought help to stop autoplaying video ads from as early as 2012. The frustration experienced by the poster in YouTube’s help forum below is palpable. In the post, he specifically calls out video ads that appear in the sidebar. (As a side note, some in the industry also blame YouTube’s pre-roll ads, which play before a video loads, for pushing more people into downloading ad blockers). Autoplay video ads are so disliked that technology publications have written guides on how to shut them off. Given these ads completely interrupt the browser’s experience by playing unwanted video and sound, usually without warning, it’s unsurprising it gets the brunt of the ‘this ad is disruptive’ criticism. Most websites host third party advertisements distributed by ad publishers. That means it’s very difficult for the website to control the quality of the ad content they display or ensure its security. This disconnect in quality and security between the website hoster and the advertising publisher has pushed a lot of technically savvy online browsers to use ad blockers. Forbes.com, a site which has experimented with blocking access to those using ad blockers, suffered a big security embarrassment in early 2016. 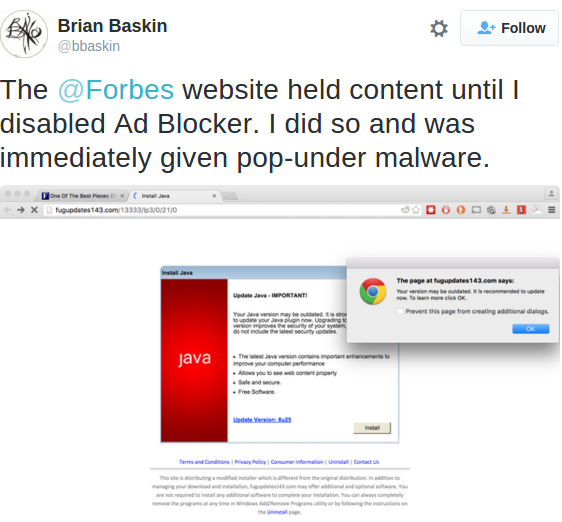 A noted security researcher disabled his ad blocker to access their website, only to be served malware through an ad hosted on Forbes.com. The thing is, Forbes technically wasn’t responsible for the offending ad -- it was their ad publisher that did not properly vet the ads they were displaying for Forbes. But Forbes’ brand absorbed the majority of the negative feedback. The Forbes case was one in a series of high profile security gaffes that have affected major publishers like The New York Times and the BBC. For those already skeptical about the safety of online ads, these cases only reinforce that perception. How long are people are willing to wait for a website to load before abandoning it completely? Kissmetrics states that 47% of online browsers expect a website to load in 2 seconds or less. Google claims 74% of people will abandon a mobile website that takes more than 5 seconds to load. People don’t have a lot of patience and, unfortunately, heavy ads seriously add to a website’s load time. If an ad takes too long to load, it negatively affects both the website that hosts the ad and the advertiser. When people abandon a page because of long load times, the website loses a visit and the advertiser loses a potential click. The New York Times recently reviewed prominent news websites and calculated how much advertisements contributed to overall load times. For some websites, the advertising content was up to 3 times heavier than the page’s editorial content. The heaviness of advertisements also is a cause for concern for mobile users who have limited data plans. The Times helpfully calculated how much loading each webpage’s advertisements would cost on a mobile data plan. Ad blocking has increased substantially on mobile devices, especially in regions with many mobile first internet users. A recent estimate pegged mobile ad blocking growth at 90% year over year, with 429 million people globally using an ad blocker on their mobile phone. Ad blocking extensions have been available in mobile app stores for a while, but Apple stunned ad publishers in late 2015 when they announced their Safari mobile browser would support ad blocking in iOS9. With that announcement, Apple effectively cut off advertisers’ access to millions and millions of iPhone users globally. The resulting press coverage said the announcement was “a bad move” that could “change the web forever”, and some even asked if “this the new piracy?”. Our survey respondents welcome the ability to block ads on mobile, with 83% indicating they’d like the option to block mobile ads. 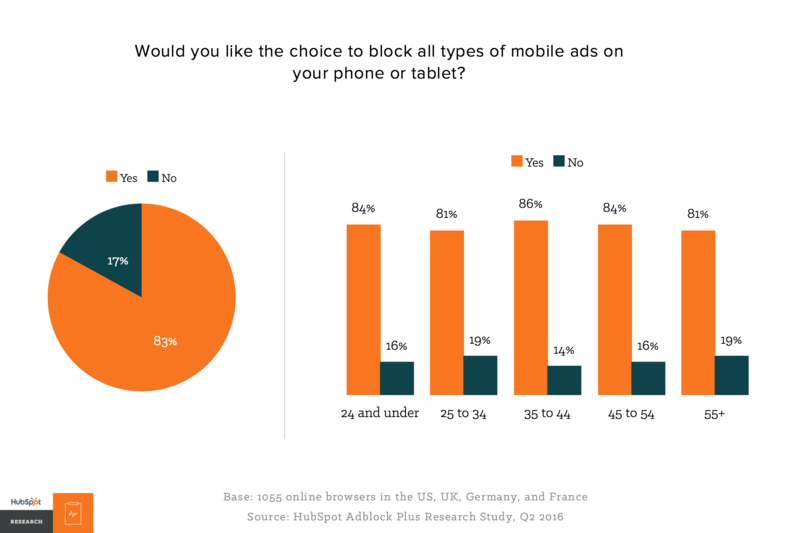 Across age groups, the majority favor ad blocking on mobile devices. The highest proportion of “yes” respondents were in the crucial 35 to 44 age range -- folks who have a lot of spending power now. When asked to specify which mobile ad types were annoying, 73% said ads that pop over the entire screen were the worst. That’s followed by ads that tracked their browsing from their desktop and a variety of video ads. Are there any useful or valuable mobile ads? Our survey respondents think search ads are indeed useful. 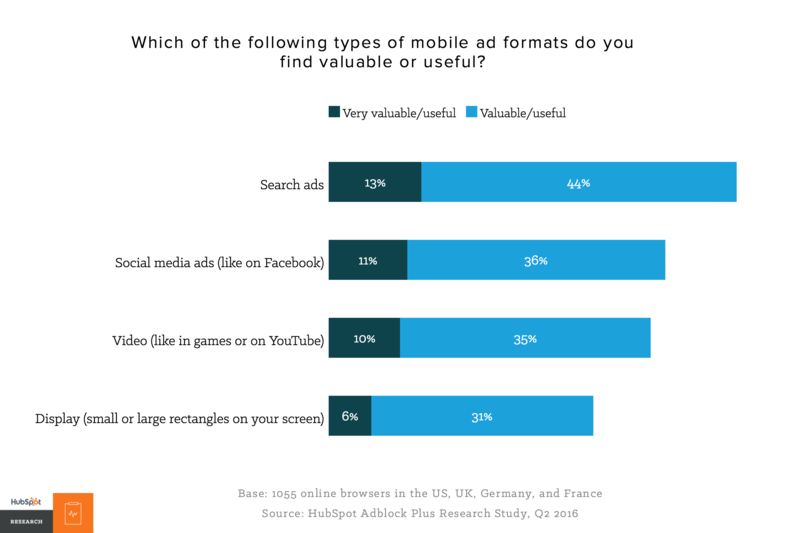 Mobile users value search ads compared to others likely because they’re relevant to their information needs. Social media ads, which are fairly unobtrusive, are useful for 47% of respondents. Display ads are the least useful or valuable. So we’ve established the main drivers that push people to install an ad blocker. The issues caused by online ads have culminated in the widespread adoption of ad blocking tools globally. The effect ad blockers have had on publishers has been tremendous, with advertising organizations estimating that by 2020, $35 billion dollars per year will be lost as a result of blocked ads. In light of the huge revenue losses facing content producers and advertisers, we asked ad blocker users: if they had to justify their use of ad blocking software, what would they have to say? 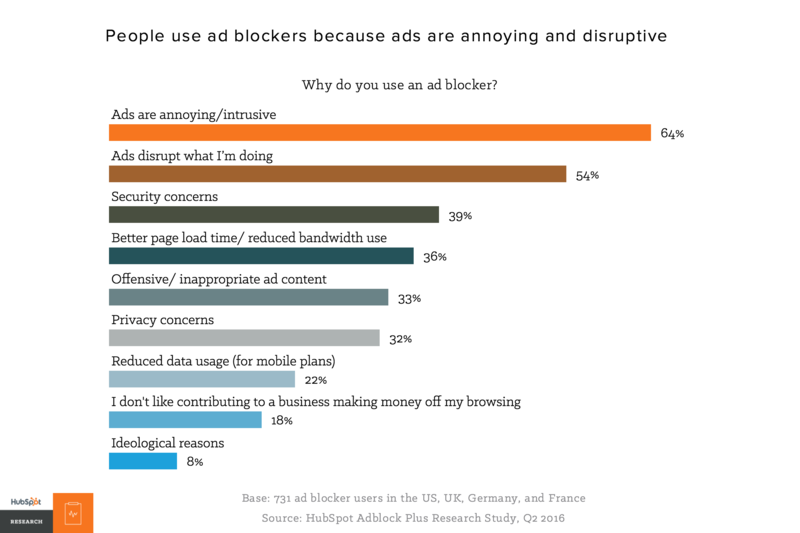 Half of ad blocker users see it as a way to control their online browsing experience. For them, it’s a right and a convenience. 44% also echoed concerns around slow load times. 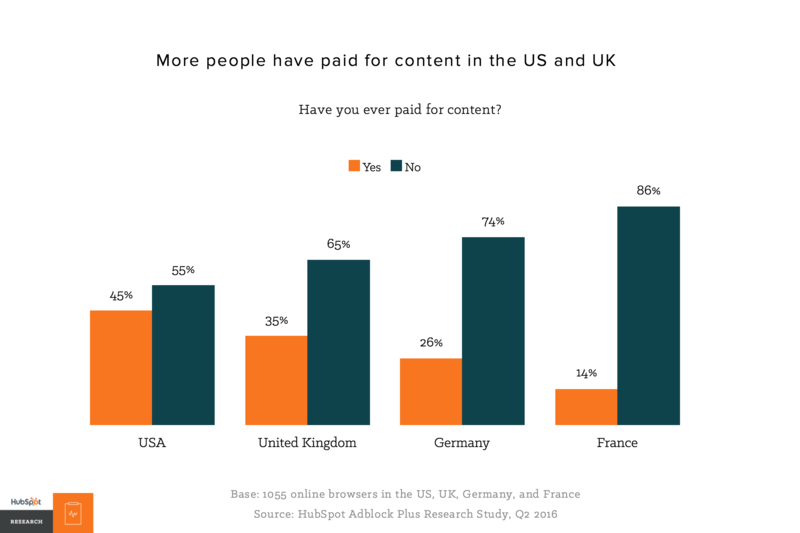 Worryingly for content producers, 15% matter of factly state that they don’t care how websites make money. The Interactive Advertising Bureau (IAB), a global organization that represents media and technology companies that deliver, sell and optimize digital advertising, is very strong in its statements: They think ad blocking is wrong. The problem is, most online browsers today don’t see a problem with it -- including people we surveyed who don’t use ad blockers. 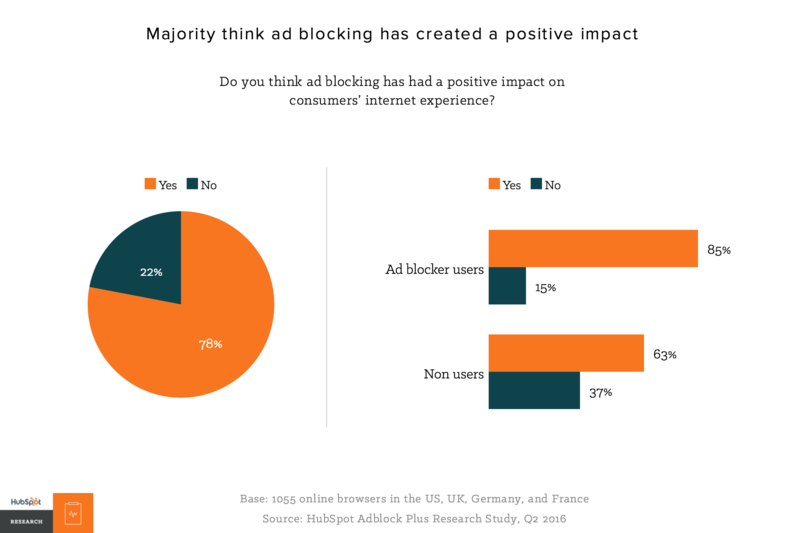 In fact, a majority say ad blocking has had a positive impact on the internet experience. This sentiment means trouble for online ad publishers -- in the court of public opinion, people view ad blockers positively. That point of view will be hard to change. While the relationship between advertisers and ad blocking companies is contentious, the two groups agree on a couple of things: 1) the experience ads create is currently a problem which leads to 2) ad blocker adoption continuing to increase over time. Use technologies, like PageFair or Sourcepoint, that helps them get around certain ad blocking extensions by re-inserting ads and also measure the impact ad blockers have on traffic. Apply to or pay to be part of a whitelist of websites maintained by ad blocking organizations that promise to only display ‘acceptable ads’. Users of the ad blocker can then consent to see ads on those whitelisted sites (disclosure: our research partner, AdBlock Plus, maintains an acceptable ads program). This particular option is disliked by the ad industry. Experiment with ways to get visitors to pay for their content, either through subscriptions, micropayments, or one-time donations. Some allow all browsers to see a few articles before blocking access and requesting payment, while others just block access to content to browsers using an ad blocker. The success rate of these policies have been hard to track and measure, but they're the most visible to online browsers. Many websites have tried this option, and the IAB recently released guidelines called ‘DEAL’ to help publishers persuade visitors turn off their ad blocker in order to access content. Regardless of the options websites choose, the onus is on them figure out a way to monetize their content. And it’s been clear: Finding a workable solution around ad blocking has proven to be tough. A few notable sites have experimented with option 3. 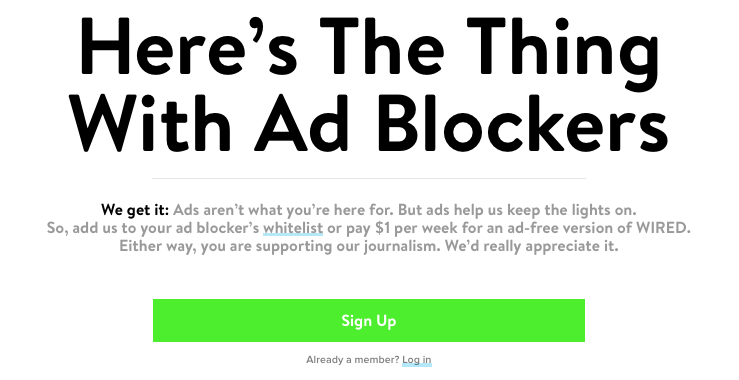 Wired.com announced that they would cut off access to their content to anyone using an ad blocker in February 2016. They laid out their case on why they needed advertising to fund their site and gave two reasonable workarounds to access their content: Visitors could either whitelist their site (in exchange for seeing what they described as more ‘polite’ ads) or donate a dollar a week to get a completely ad free experience. Other publications, like the Washington Post, ask ad blocker users to create an account or subscribe to unlock content instead of whitelist. In contrast, The Guardian has chosen to continue giving all visitors access to their content. They’ve placed a less prominent call to action at the bottom of their web pages when they detect an ad blocking extension, asking people to support the site by donating directly. 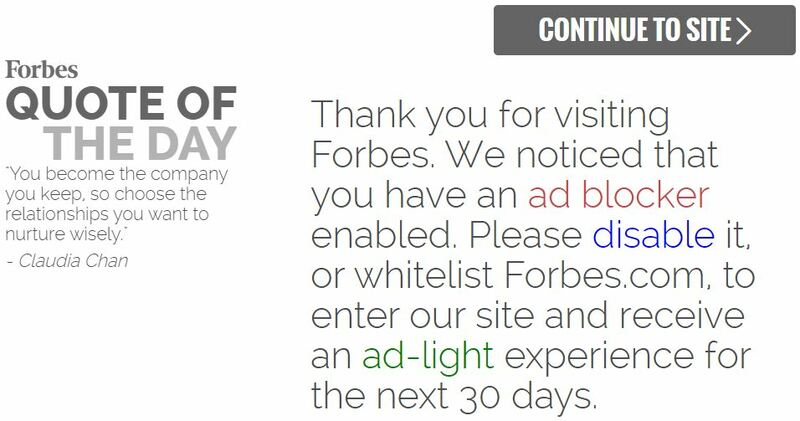 Our final example, Forbes.com, has experimented with a number of options for visitors who use ad blocking software. Initially, visitors with ad blockers saw a message asking them to turn off their ad blocker in exchange for an ad light experience. The copy then changed as visitors were asked to either turn off their ad blocker or whitelist the site. More recently, Forbes’ tactics changed again as they began asking visitors to create an account and sign in to access content. 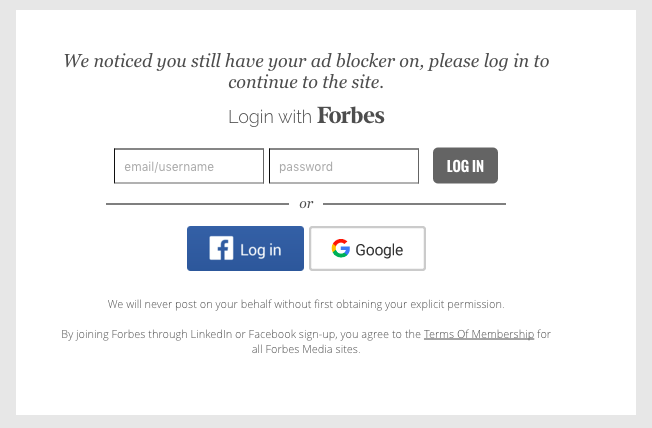 Forbes also displays its homepage to ad blocker users, but once the visitor clicks a link to an article, Forbes displays the request to turn off the ad blocker. The frequent changes in tactics seem to reflect the fact that Forbes, and many sites like it, haven’t found the most effective approach to get visitors to turn off their ad blockers. As a result of the technologies being used by websites like Wired.com and Forbes to block ad blockers, a new app The Next Web comically dubbed the “Adblocker-blocker” cropped up. The app tricks anti-ad blocking technologies into thinking a visitor isn’t using an ad blocker when they actually are. Likewise, former Mozilla co-founder and CEO Brendan Eich unveiled a completely “ad free” browser called Brave in January 2016 -- the browser automatically blocks ads but shows approved ones run through the Brave Ad Network. Unsurprisingly, the ad industry hates the concept. This technological brinksmanship is farcical (and will continue because huge amounts of money are at stake), but it points to how easily new technologies can crop up to either combat ads or force ads upon online browsers. All this reflects the lengths content publishers and online browsers are willing to go against one another. But at the end of the day, it’s a distracting race to the bottom that doesn’t address the real problem: bad ads. As we’ve seen in the examples above, many websites have tried to attack the ad blocker problem by cutting off access and/or asking people to pay. In our survey, we asked current ad blocker users what options would encourage them to turn off their ad blocker. Our respondents were split: A third of ad blocker users would not turn off their ad blocker, regardless of the situation. 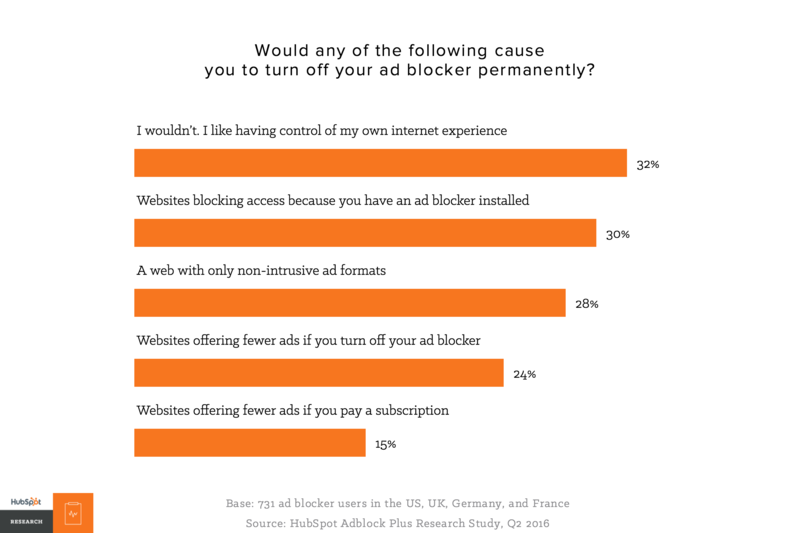 30% were willing to turn off their ad blocker if they were denied access to content. 28% said they would do so if there were only non-intrusive ads online. Paying a subscription was the least appetizing option. When faced with the scenario of being blocked from a website, our respondents (both users and non users of ad blockers) gave fairly consistent feedback. 28% would simply stop visiting the site while 16% were willing to disable their ad blocker to access the content. Is it all doom and gloom: will people accept any advertising online? 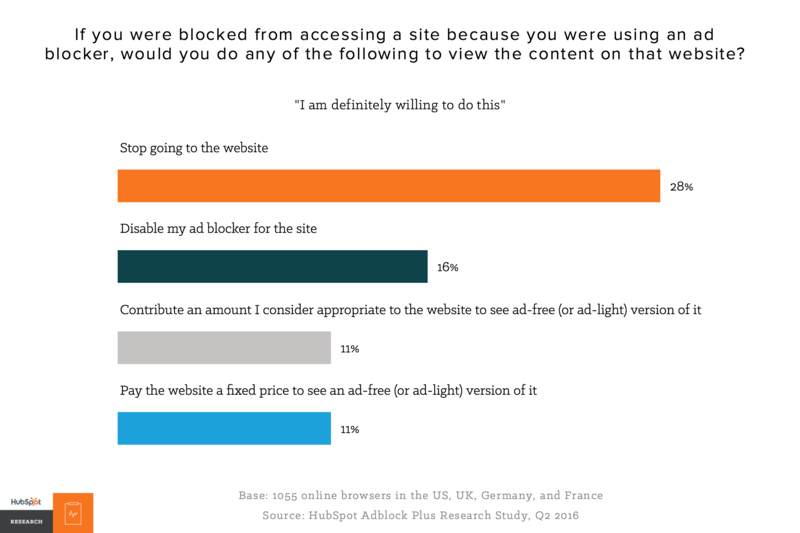 In the scenarios we presented to respondents, a significant portion of those surveyed resisted the idea of turning off their ad blockers or paying a subscription if they were blocked from getting content. As a result, we expected our respondents to be consistently hardline against ads, but a majority indicated that they are fine with seeing them -- just as long as they’re not annoying. This sentiment means there are workable ways for advertisers to reach their audience. People are open to sharing their online experience with ads as part of the ecosystem. The clear caveat is that the ads being displayed should not be disruptive or intrusive. That means the worst offender ads -- pop ups, auto playing videos, mobile ads that take up the entire screen, heavy ads that affect load time, deceptive and low quality ads, etc -- need to disappear. As for current tactics employed by websites who rely on advertising revenue: though the majority of respondents in our study have not paid for content, it does appear younger browsers are more open to paying compared to older browsers. Younger respondents are also more willing to turn off their ad blocker to access content. 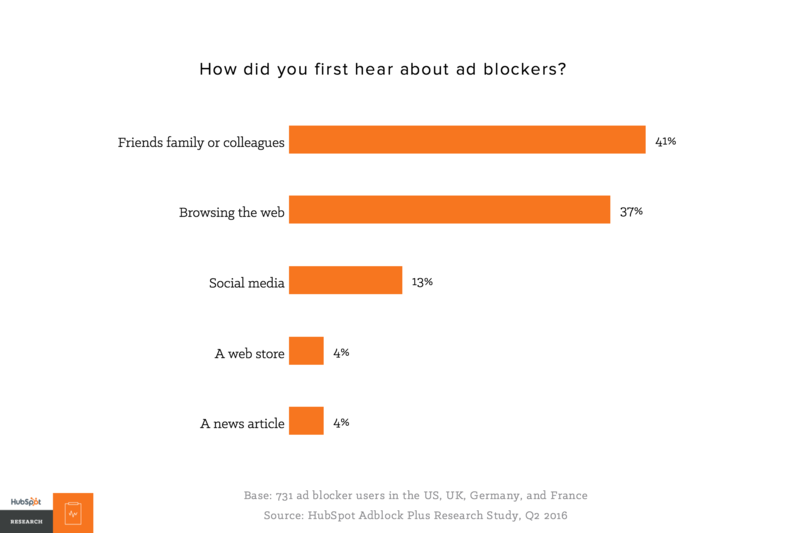 42% of respondents 24 or younger would turn off their ad blocker compared to just 14% of people 55 or older. There is opportunity for websites today to train younger visitors to turn off ad blockers or pay a subscription. 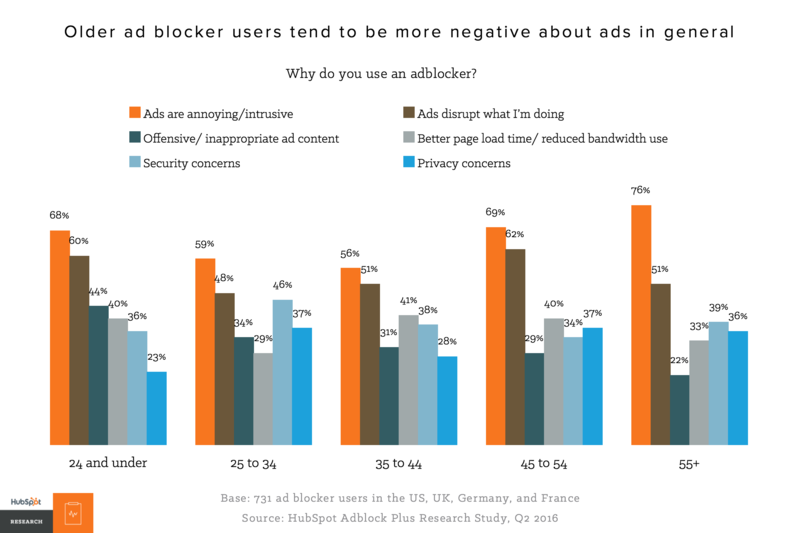 Based on sentiment, older respondents in our sample seem more anti-ad in general, and as a result, aren’t as likely to turn off their ad blocker or pay for content. Our young respondents rate adverts harshly too, but express more willingness to support websites. 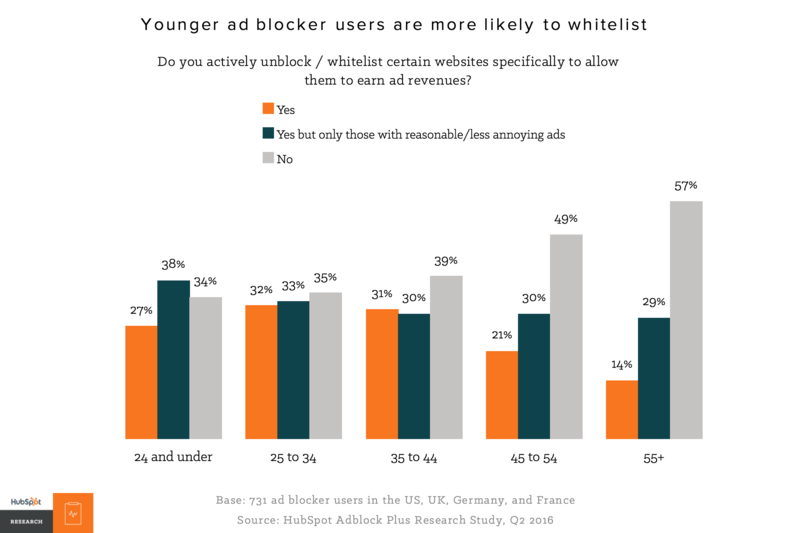 Continuing the thread, younger ad blocker users are also more likely to whitelist websites. To retain this segment of the population that’s amenable to supporting content creators, it’s up to advertisers to create ads that truly are unobtrusive and high quality. It’s possible to get younger browsers on board, either through whitelisting, turning off their ad blocker, or payments, but the key is to provide an experience that will not alienate them. Otherwise, the ad blocker will get re-installed. When we look at sentiment data by geography, feelings against ads seem stronger in France and Germany. 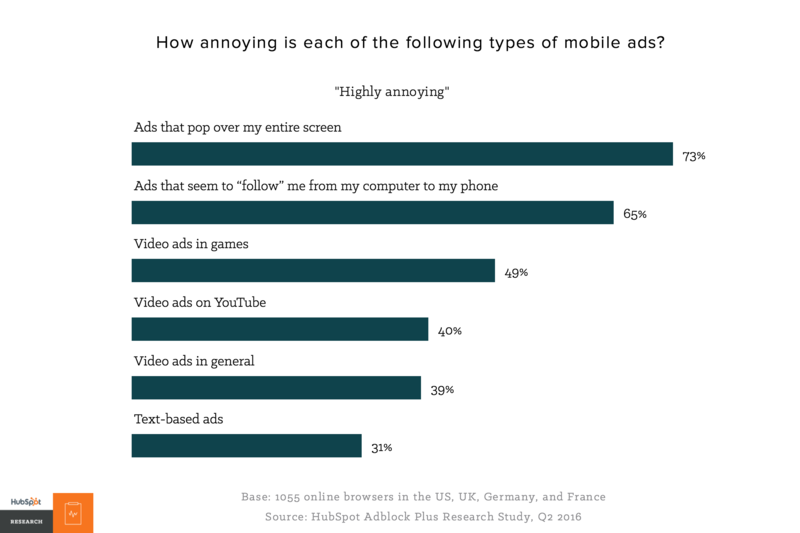 70% and 65% of French and German respondents say ads are annoying. US respondents have the highest concerns around security and privacy (47% and 39%, respectively). 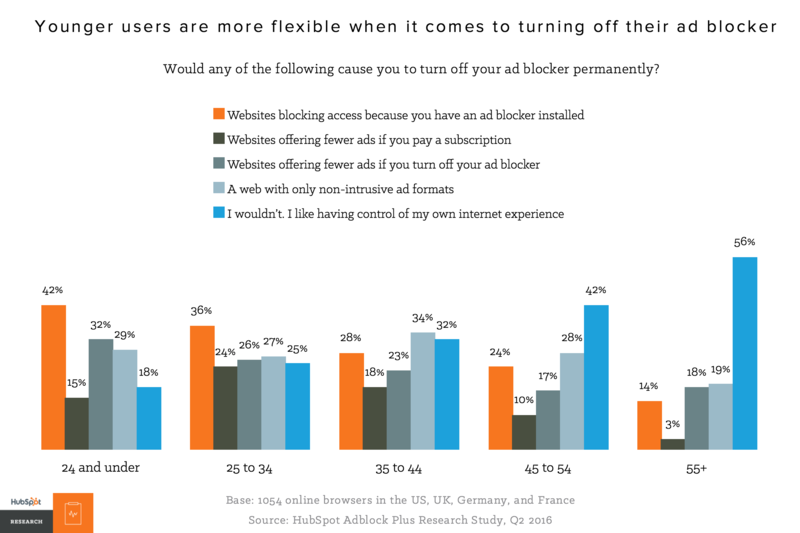 US and UK based respondents are more willing to turn off their ad blocker when they’re blocked from access. 34% of German users hope for a web with only non-intrusive ads. 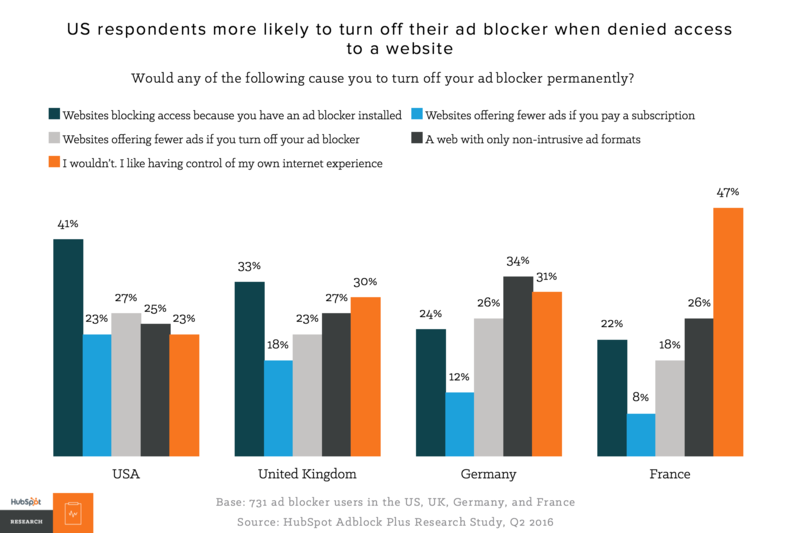 A quarter of respondents in the US, UK and Germany would turn off their ad blocker in exchange for seeing for fewer ads. 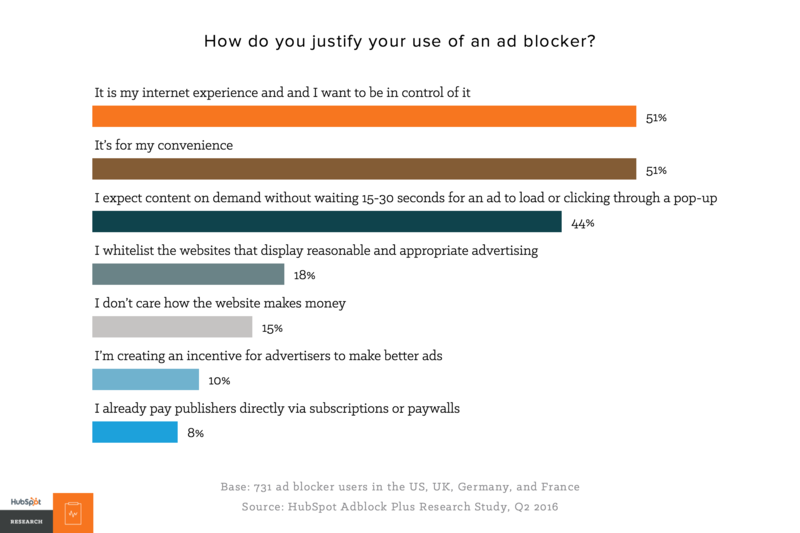 In contrast, 47% of French respondents would not turn of their ad blocker. Likewise, more US based browsers report having paid for online content in the past. Generally, US ad blocker users can be negotiated with, whereas French users are a lot more hardline about turning off their tool. Advertisers in different regions will have to contend with varying degrees of hostility in their audiences, and the approaches they take need to vary from country to country. Today, we're in the midst of tremendous change in the digital advertising industry. The online ad industry, and the publications that rely on it for revenue, are at a watershed point because ad blocking has diminished the impact ads have online. 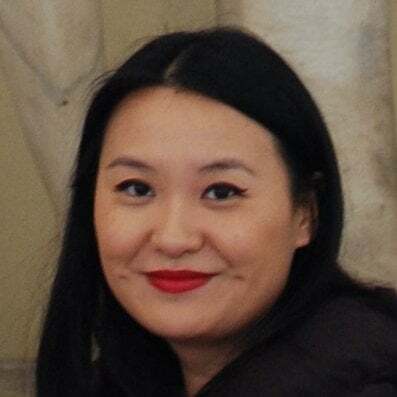 Yet their wounds are largely self inflicted: the poor experience generated by online ads directly caused the runaway adoption of ad blocking tools. How advertisers respond to ad blockers will shape their industry and the experience of all online browsers in the future. If advertisers can agree to only display unobtrusive ads, our study shows there are a lot of people around the globe who are willing to look at them. Consumer behavior should dictate strategy. The next phase for the ad industry should begin with an understanding of what creates value for consumers. HubSpot Research partnered with Adblock Plus to create the survey questionnaire. HubSpot managed the online survey and localization while AdBlock Plus contributed sampling budget. Survey sample was provided by Survey Sampling International (SSI), via SSI’s general population panels. The total sample size is 1,055 responses in the US, UK, Germany, and France. Survey takers were screened for laptop or desktop computer and smartphone ownership. Quotas were implemented to ensure a roughly 70/30 split of ad blocker users and non-users in each country. The survey was fielded from May to June 2016, and available in English, German, and French.